Comparing the new Lal Jose movie Ayalum Njanum Thammil with his previous hit film Classmates is totally rubbish. The movie has very little to do with Classmates. Bobby-Sanjay’s Ayalum Njanum Thammil is a journey through the life of a doctor, in fact the journey through the most important phase of a doctor’s life. How he is molded to be a sensitive irresponsible human being to a humane and matured doctor. The film scores mainly for its theme which is relevant and fresh. The plot revolves around doctor Ravi Tharakan who at present is in media attention for doing an operation without the consent of her parents. While he goes missing after the incident, the PA of the hospital’s chief tries to have a look at his life. Through various persons she meets, she realizes about the truth behind Dr. Ravi Tharakan. His college life, his love life and ofcoz his professional life with Dr Samuel which molded him to be what he is now. Well, the plot has this feel of Usthad Hotel and Diamond Necklace with the title character having some similar attitude and all. But even though it has these dependencies Ayalum Njanum Thammil scores for its theme. With all these Satyameva Jayathe findings about doctors making talks among the people Bobby-Sanjay tries to throw light on what a doctor should be. With good mix of personal and professional feelings, the movie is really an engaging one. Only possible drawback I felt in this movie was the strength of the event that makes Ravi realize about his goal. On screen, I think this is one of the best performances ofPrithvirajas an actor. With almost all shades of emotions, he comes out with a performance that should be applauded. I wish to see him in more such roles rather than muscular one man shows. Mr Prathap Pothan delivers an excellent performance as the caring, strict and full of wisdom character of Dr Samuel. Well the rest of the cast has less screen time but all those characters have an importance in the life of Dr Tharakan. 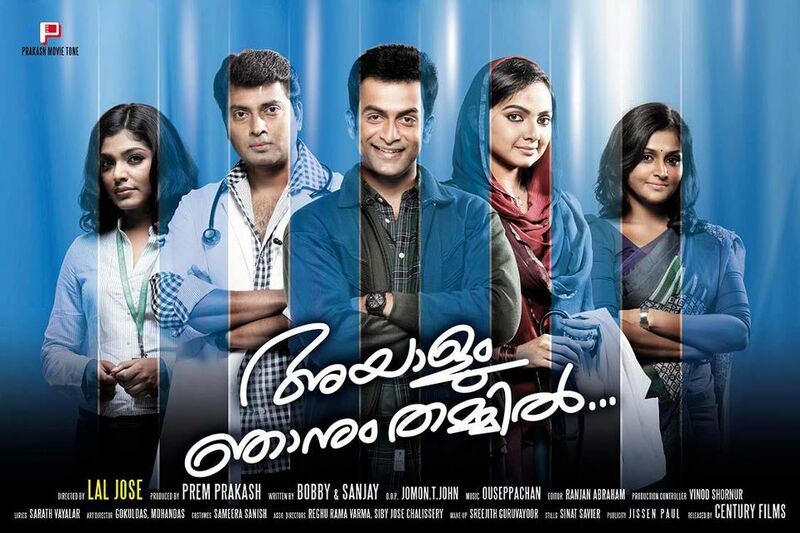 Narain as his close friend Vivek, Rima as a girl who tries to assist him in his tough times, Samvritha as the beautiful love of Tharakan, Remya as his colleague, Kalabhavan Mani as the police officer who eventually becomes an important character, Salim Kumar as the interesting patient and many more. In the backend, Lal Jose shows his excellence once again with an engaging treatment on the script. Bobby and Sanjay come up with a script that is unique and relevant. The way they have assembles the back and forth narration is really beautiful. Smart jokes are there involving MBBS studies. It is interesting how the screenplay embeds small scenes that look less important playing as bridges to certain other portions of the movie. About the cinematography of Jomon, I am speechless. Munnar’s beauty is fully there and the lighting of some interior scenes was brilliant. Editing is fine and the BGM is adequate. Ouseppachan comes up with some descent tracks and “Azhalinte Aazhangalil..” tops the chart for all the reasons. If you are not expecting a commercial mass masala movie with drastic twists and turns, this sincere movie will satisfy you for sure. RATING- 3.5/5 for Ayalum Njanum Thammil.